This episode is sponsored by Quince & Co, where you will find 100% American wool yarn spun in their historic mill in New England. Quince has expanded over the years with responsibly sourced plant and animal fibers. Quince’s newest addition is Willet, responsibly grown ©Cleaner Cotton. Find them at www.quinceandco.com. I am also a Craftsy Affiliate. This means that if you click from the Craftsy link on my website and purchase a class or supplies, I receive credit for it. It is an easy way to support the show. Thank you! In this episode I chatted with designer, Elizabeth Doherty, about her new book. Top down: reimagining set in sleeve design by Elizabeth Doherty and Quince & Company. This interview was recorded on August 8 2015. 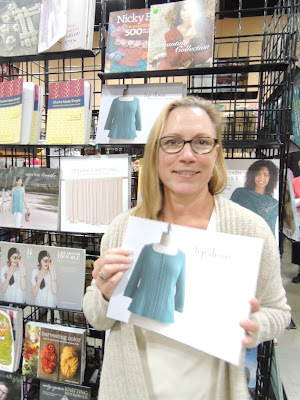 Elizabeth sees her book "in the wild" for the first time at Stitches Midwest. Elizabeth’s newest design is called Helvetica, in Quince & Co Kestrel, organic linen. Have a great week! Haste ye back, and hold your knitting close. Paula, I really enjoy your podcast and have since the beginning. The interview with Elizabeth is lovely. I have a comment though, about the new book. I am not a designer, just a knitter, so maybe I don't understand. I don't wear pullover sweaters, I find I'm too hot. I love cardigans. I love only one cardigan from Elizabeth's book and I would have to purchase the whole book for that one pattern which I don't want to do. Is there a reason why patterns can not be released individually? Maybe you could talk about this sometime on your podcast. I really enjoyed your interview, her patterns are beautiful. I think a copperplate sweater would be a great addition to my work wardrobe. Tough choice!! I really enjoyed this podcast and am intrigued to learn about her set-in sleeve technique. I just left the Anonymous comment and didn't realize that I didn't sign my name!! !